A recent study by RBC Capital Markets predicts that installations of Alexa devices could reach 128-million units by 2020, creating an enormous new market opportunity for commercial and residential AV installation companies, according to AV Junction founder and CEO Paul Weatherhead, but only if firms take steps now to ensure they are staffed with freelance professionals who have smart technology experience. According to Weatherhead, Alexa for Business will work with built-in features customized for an office setting, including the ability to make calls and check security camera feeds. Amazon is also hoping to work together with software developers to build many more office-specific apps like managing work calendars and setting the stage for a meeting by dimming lights, lowering blinds, and adjusting temperatures in the conference room — functions that make the AV installer’s role more important than ever before. “Installers have to let their customers know that they are the very best Alexa consultant available to them and that getting the right benefits from voice enabled installations requires the assistance of a true professional installer who understands how to design and install the right voice enabled system for their unique situation,” Weatherhead challenged. Qualified Applicant Searching: AV companies can quickly find qualified and competent AV technicians in local or remote areas if their go-to talent is unavailable. 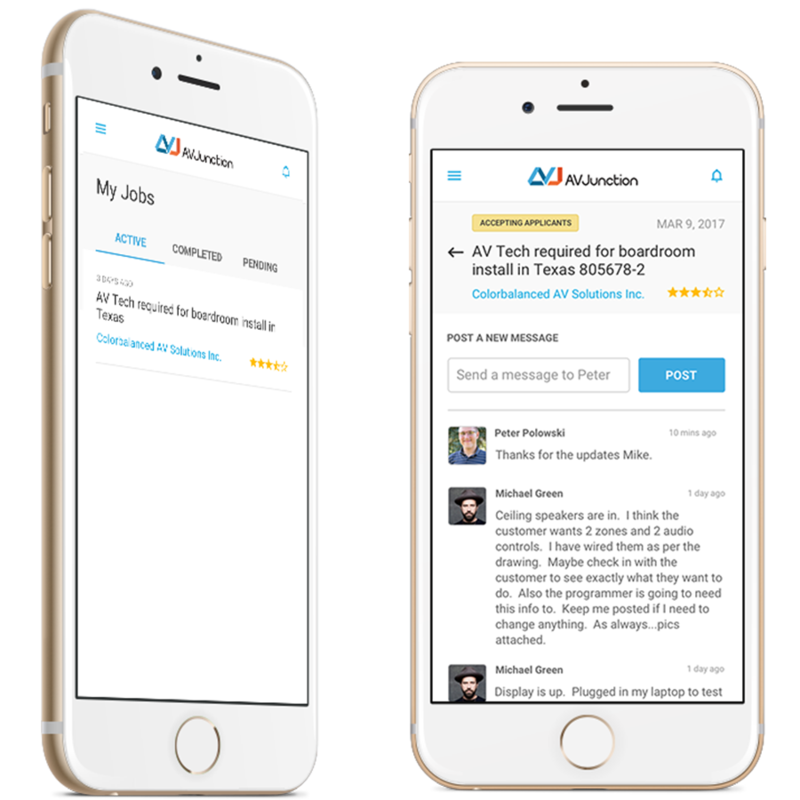 Milestone Payouts: AV companies and freelancers can set customized project ‘milestones’ on fixed priced work orders to provide insurance of work completion, thereby improving customer satisfaction. Secure Payment Processing: A payment processor by STRIPE Connect handles payouts in multiple currencies and leverages a sophisticated milestone completion process. The milestone process ensures that freelancers get paid securely and on time, and allows employers to approve payouts when work is completed properly. Ratings System: AV companies can rate freelancers after each project, boosting attractiveness to other potential employers after a job well done. Freelancers can also rate employers on factors like communication, use of tools, and timeliness of payment. AV Junction is available to commercial and residential systems integrators, rental, live event and staging professionals, exhibit and production houses, and audiovisual manufacturers globally, wherever Stripe is accepted. Interested customers can sign up for a free three-month trial to begin. After 90 days, users can choose between an ‘Economy’ package, with a pay-as-you-go model offering access to the site and a flat fee per hire, or a ‘Professional’ package which includes a $150 USD monthly subscription with full site access, full features, and a discounted flat fee per hire. To register for the platform, click here. For more images, click here. AV Junction is a global freelancing platform for the audiovisual industry that makes it easier for AV companies to find, hire and manage AV freelancers and provides freelancers with more employment opportunities. AV companies can post jobs, search a vast base of freelancers, create work order contracts for hiring, use tools to manage freelancers, and make timely payments. The platform allows freelancers to showcase their skills, search for short-term jobs, submit quotes, easily provide progress updates, and secure efficient payments. For more information, visit http://www.avjunction.com/.